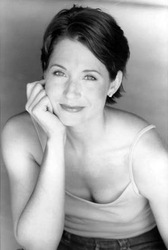 Cynthia Cranz has been acting professionally since 1991. She has appeared on stage, TV, radio, film and in comercial print. Born in Fort Worth, TX, she graduated from Grapevine High School and is an alumnus of The University Of Mississippi where she minored in Psychology, earning a degree in History. After college, she returned to her roots in Fort Worth, where she worked in local theaters and continued studying acting. She signed with The Tomas Agency in 1993 and has been working with Funimation since 1999, when she was cast in her first Anime role, as Chi Chi on DBZ. Next came Boton on Yu Yu Hokusho, Mitch on Case Closed, Mitzi on Shin-Chan, Paninya, on Full Metal, Diana on Lupin the Third, and Coach Mo on Big Windup. Other favorite supporting roles include shows such as Negima, Kodacha and One Piece. She currently resides in her native Fort Worth with husband Mitchell McManis and their several four-legged fur babies, where she continues to act, practice real estate, ride h orses and compete in equestrian events.